Evelyn is originally from New Jersey and Delaware, and has now lived in the Sarasota/Manatee county area of Florida for over 25 years. She received a Bachelors Degree from the University of Delaware and has also attended The Pennsylvania Academy of Fine Arts and Ringling College of Art and Design. In 1984 Evelyn began exploring the world, visiting 48 of the 50 states as a scenic artist with Ringling Brothers, Barnum & Bailey Circus. She now continues to explore the country through the educational and conservation efforts of Haai, Inc. Shark Encounter, the family business. Evelyn’s travels throughout the United States, Europe, Mexico and Canada along with a year residency in Japan have shown a wide diversity of life and given her the opportunity to share experiences through art. 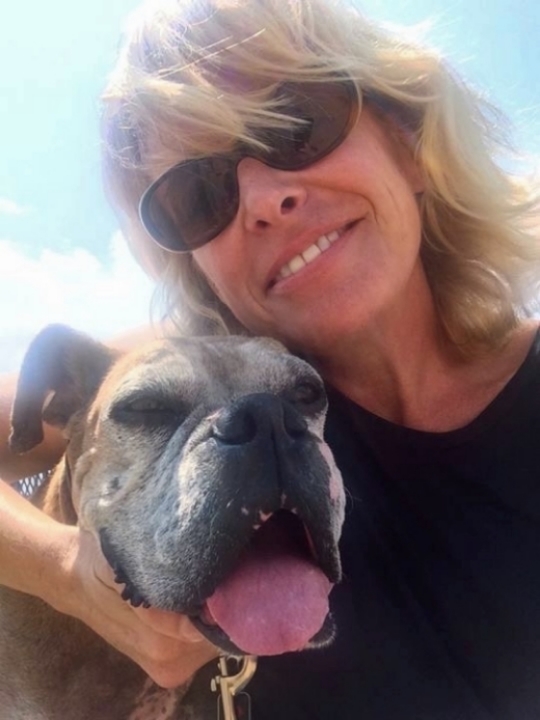 In 2007 Evelyn adopted a nine year old Boxer female named Tilly through Florida Boxer Rescue. After adopting two Boxers over the years she is now officially a Foster for Boxer Rescue Angels of Florida. Evelyn donates her work to rescues and shelters around the country to raise funds that directly help animals in need and their caretakers. Her dog portraits have recently been published in 1000 Dog Portraits - From the People Who Love Them and Richeson75 International, Animals, Birds & Wildlife. Evelyn’s work is represented by Art Uptown Gallery in Sarasota, Florida and held in private collections throughout the US, Canada, Australia, France, Spain and the Netherlands. Evelyn has received residencies and fellowships from Weir Farm National Historic Site, Zion National Park, Jentel Foundation, Dorland Mountain Arts Colony and The Brush Creek Foundation for the Arts. She is a member of the Petticoat Painters, one of the oldest, continuously exhibiting women’s art groups in the United States. Evelyn serves on the governing board of Myakka River State Park with a dedication to bring artists and nature together. Evelyn shares her 12-acre home Barking Dog Ranch, with her husband Philip, dogs, visiting horses, sharks, and the occasional sea lion stopping by from next door. Her life is a menagerie of the people, places and happenings of a distinctive south Florida experience.